The Magnavox MMA3639 is one tough speaker meant to be taken in to the wild. With its water resistance and dust protection weather or terrain should never be a concern to take it a step further it was created with an ergonomic design to create the highest level of comfort when carrying around. 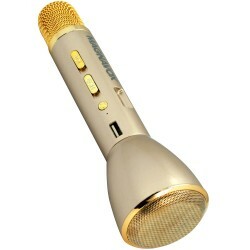 This portable microphone lets you record on the go or amplify your voice when playing some of your favorite smartphone games like karaoke or charades. Connectivity is simple with Bluetooth Technology and a 3.5mm Aux port. 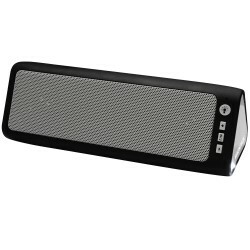 The Magnavox MMA3626 Portable Bluetooth Speaker is a great idea for any desk or night stand. 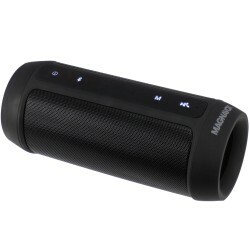 This small portable speaker can play all devices with a 3.5mm auxiliary port or Bluetooth making keeping connected simple. With its physical tactical buttons using this unit is comfortable and easy. 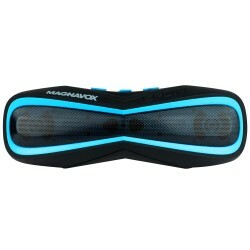 This small portable speaker is great to clip on to any belt or backpack and work great under rain or shine. Keep things flashy with its color changing lights to brighten any mood. 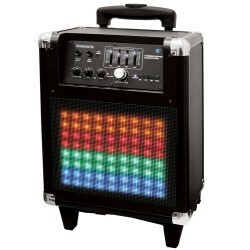 The MHT825 Portable Rolling Speaker System allows you to bring the party with you! Enjoy incredible sound with its high powered built in speakers and light up the room with its decorative lights which pulse to the beat. 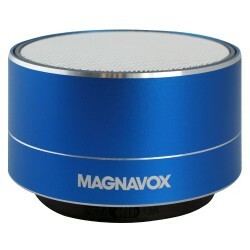 Enjoy fun karaoke nights or a sunny day at the park with Magnavox. Big Sound in a Strong Speaker, Music is easy with the MMA3683n. Simply connect your phone or MP3 Player via Bluetooth to enjoy your favorite tunes. No Bluetooth? No Problem ! Put your mp3 files on a USB stick and you are ready to go ! The look and feel of the classic boombox makes a comeback with the MMA3680 with a modern twist in design. 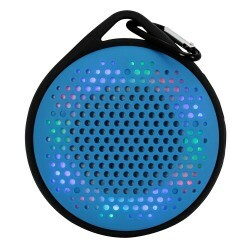 Enjoy your music anywhere you go with this easy to carry speaker. 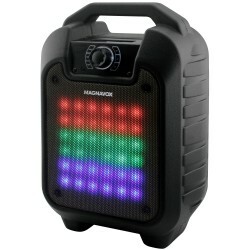 The Magnavox MMA3685 Portable Speaker with Color Changing Lights is an easy way to carry the fun with you, simply throw it over your shoulder and play your music. 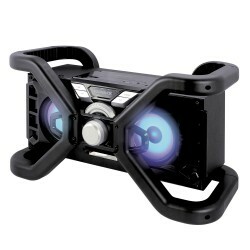 This speaker will bring that loud crisp sound to make every note heard across the room. 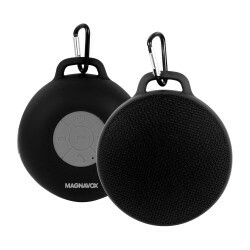 Take your music with you on the go, the Magnavox MMA3705 is a great speaker to carry around. With the power of Bluetooth it is easy to play music wirelessly from your phone or other Bluetooth enabled devices. 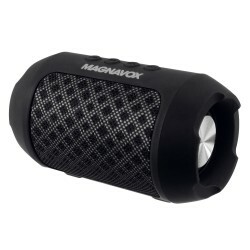 Take your music with you on the go, the Magnavox MMA3742 is a great speaker to carry around. With the power of Bluetooth it is easy to play music wirelessly from your phone or other Bluetooth enabled devices. 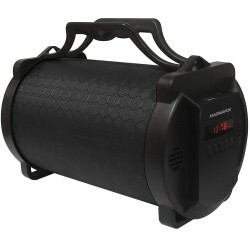 The MMA3743 Outdoor Waterproof Speaker lets you listen to your music out loud in rain or snow. Simply hook it on to something and wirelessly stream your music via Bluetooth connection.